Now slicing fancy cheese right at home is fast and easy. With the adjustable stainless steel wire cutter, you can slice paper thin slices or perfectly even slices up to ¼" thick. Your grilled cheese sandwiches have never had it this good! Top burgers, sandwiches and crackers without breaking a sweat. Fancy hors d'oeuvres? No problem. The Bellemain Cheese Slicer can handle it all. 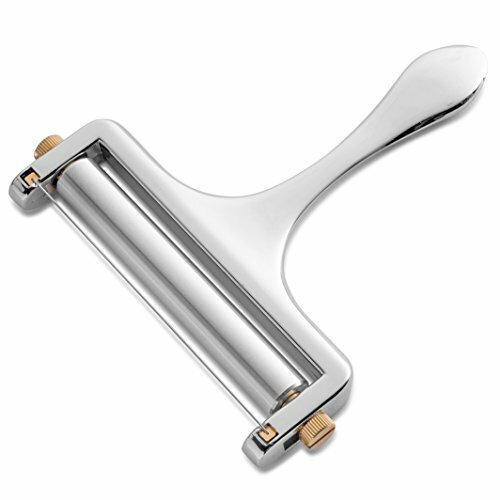 By far, the Bellemain Cheese Slicer is the most elegant slicer on the market and it's easy to see why. The single, solid cast zinc alloy body is both beautiful and extra-strong. You'll be slicing cheese effortlessly for years into the future. After you've experienced how easy and fast slicing cheese can be with the Bellemain Slicer, you'll never go back to cutting up bricks of cheese with a knife. The cutting wire never needs sharpening, unlike knives. A replacement wire is included in the unlikely event that you ever need it. The Bellemain Adjustable Cheese Slicer is backed up by our comprehensive full replacement guarantee. You are going to love how your new slicer performs. CHEESE TRAYS, ANTIPASTI AND FANCY GRILLED CHEESE SANDWICHES: Stop wasting money on pre-sliced cheese. Never serve those pre-wrapped, plasticky cheese slices on your child's sandwiches again. Slicing your own cheese has never been easier. THE MOST ELEGANT SLICER ON THE MARKET IS ALSO THE STRONGEST: Cast from a single piece of zinc alloy, the Bellemain Cheese Slicer is one heavy duty piece of of kitchen equipment. It is guaranteed to last for years to come. EASILY HANDLES CHEESE BLOCKS UP TO 3.5" WIDE: Adjust the slicer to give you wafer thin slices or nice, chunky slices up to ¼" thick. No matter the thickness, the Bellemain Slicer handles the cheese with ease. IF YOU DON'T LOVE IT, YOU'RE COVERED FOR UP TO ONE FULL YEAR: We're so sure that your new Bellemain Cheese Slicer is going to exceed your expectations that we want to take all the pressure off by giving you a full 1-year warranty and a replacement cutting wire.